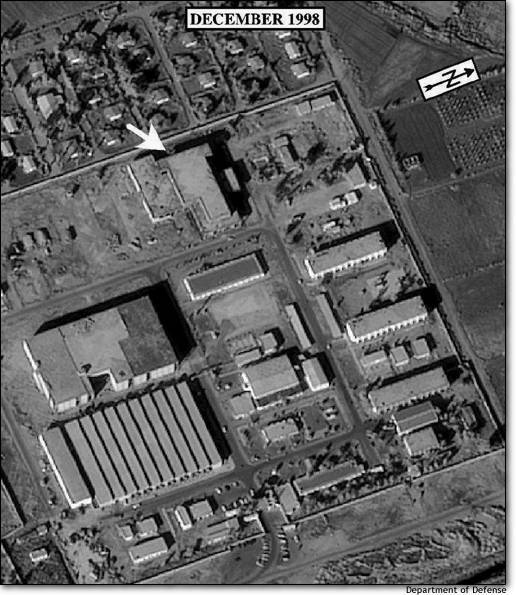 On October 7, 2002, the White House declassified two photos showing the site where Iraq was, prior to 1991, building the Al Furat gas centrifuge manufacturing facility. This facility, which was under construction at the time of the Persian Gulf War, would have been Iraq’s main site for making gas centrifuges in the 1990s. Western intelligence was unaware of this site prior to the Gulf War, and this site was not bombed. It was discovered in the fall of 1991 by the inspection process. This site was inspected many times between 1991 and 1998. During this period the site was involved in repairing military equipment. The White House said that the first photo is from 1998 and shows Al Furat with a key unfinished building, previously named B01 by the Iraqis. This building was largely a shell in 1998. 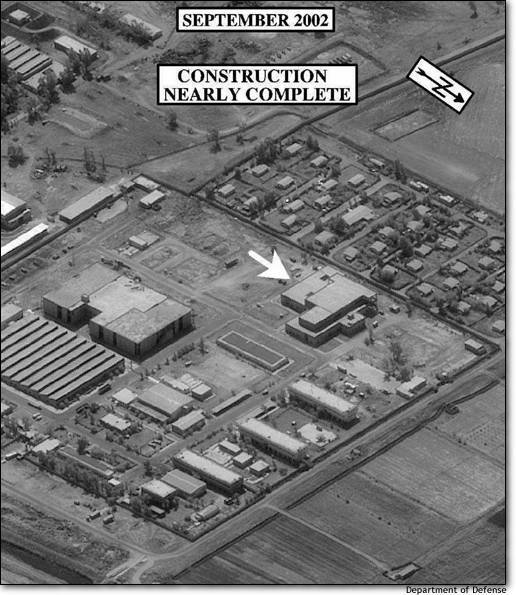 A photo from 2002 shows B01 looking more finished, but there is no indication of the specific purpose of the building. The first implication of the White House release is that this is further evidence that Iraq has reconstituted its gas centrifuge program. However, a first judgement may be misleading. For example, Iraq knows that intelligence agencies will recognize immediately the potential significance of any resumed construction of this building. Any resumed inspection regime or military campaign would focus promptly on building B01. Perhaps, Iraq wants to use the site to make centrifuges, removing equipment and evacuating the site in the event of resumed inspections or military activities. However, attempting to hide past centrifuge activities at the site from inspectors is a risky strategy. A surprise military strike could seriously set back Iraq’s program. * Is the building related to a centrifuge program? * If the building is for centrifuges, what is Iraq doing there? * Is the building for a non-nuclear purpose? What activities are planned or occurring in the building? In the end, the photos provide dramatic confirmation for the need to implement re-invigorated and strengthened inspections in Iraq. Inspectors can relatively rapidly investigate any activities at Al Furat. However, these photos provide weak support for any military action against Iraq outside the UN Security Council track. Click here for more detailed information about the Al Furat facility. 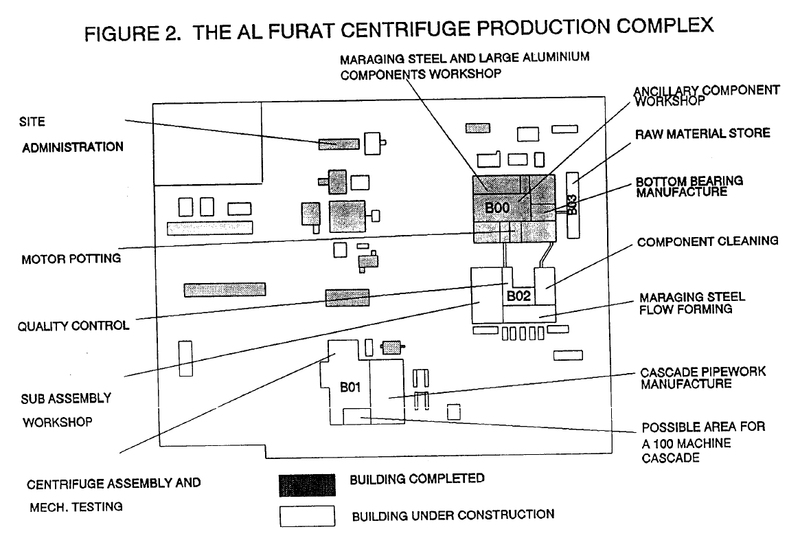 Schematic that shows Iraq’s plans in the late-1980s for producing centrifuges at this site.